Do you need a bugged cellphone? Disclaimer: We can only track phones which have monitoring software installed. Please do not ask us to track your phone if you cannot install the software.You can install monitoring software yourself or we can sell devices with monitoring software installed. Only track devices which you own. Ideal for parental or business usage. Do you need a bugged cellphone? At PattayaPI, we're able to help you install monitoring software on your devices. We can even sell you a "bugged" device. Bugged devices sold by us can be shipped anywhere in Thailand, you will then be able to monitor the activity of your device using an online control panel... Even when you're out of the country! The beauty of using bugged cellphones is that they are able to record and monitor practically everything the phone is doing. That includes private WhatsApp or LINE messages, Facebook use, phone calls, SMS messages, photos/videos, GPS locations, Tinder use, and much, much more. The software itself is completely invisible to the end user. We are able to deliver bugged cellphones starting at 13,000 THB. This price includes the cellphone itself and EMS shipping anywhere in Thailand. We are able to offer our clients exclusive discounts for monitoring software (see our blog post: 20% off mSpy promotional code), and we have worked to find the most powerful, easy to use software for monitoring devices. There can be no better way to protect your children online than to monitor their internet use, keeping them safe and protected from online predators. Monitoring software, whether installed on a cellphone, tablet or computer, is also great for corporate devices and keeping a close eye on your employees. Please note that you are responsible for your use of this software and we will not accept liability for misuse of it. As private investigators, we always suggest using mSpy monitoring software. mSpy allows you to monitor everything that is going on with your phone from anywhere in the world using an internet-based control panel which logs and displays the data. There is no better way to protect the safety of your children than by spying on their cellphone use. mSpy works with iPhones, Android devices, computers and tablets. We are able to offer our readers a 20% discount coupon for all mSpy products. Simply click the button below to be directed to the mSpy website with your discount applied. The reason we recommend mSpy is that we believe it is the best and most powerful cellphone monitoring software available. We have tried and tested many different software products for monitoring cellphone use. Only mSpy is able to grab data from the most popular mobile applications, such as WhatsApp, LINE, Facebook, Messenger, calls/SMS, video/images, and so much more! Once mSpy has been installed on your target device it is completely invisible to the end user. With many spy software you are required to “root” or “jailbreak” the phone in order to unlock the software’s full functionality. mSpy is able to retain much of its functionality without going through the process of jailbreaking your phone. However, we do recommend jailbreaking your phone before installing mSpy. This process is very easy and there are many guides on YouTube to do this… Just search for “how to root my iPhone” or “how to root my Android”. Once you have purchased mSpy, the process to install it on your target device is very simple and easy. You will receive a download link from the mSpy website, clicking the link will download and install the software on your target device. That’s it! All phone activity such as WhatsApp messages, phone calls and GPS locations will be visible only to you in the online control panel. The process to install mSpy is very easy and they offer 24/7 support through their website. If you have any problems with the software we have found their support staff are always polite and helpful. Which cell phone monitoring software is used by private investigators? Do you need to track and monitor your cellphone? As busy private investigators based in Pattaya, Thailand, we're often asked about tracking mobile phones and how this is possible. We have experimented with hundreds of different software products and have found the best, easiest to use solution for ourselves and our clients. mSpy monitoring software is the only software package that we use ourselves and recommend to our clients. This is the most powerful software available for monitoring cell phone use and mSpy have support staff working around the clock to help you if you have any problems. Because of their fantastic support staff we have no issues recommending this product and we don't recommend anything else. Many different cellphone monitors require you to jailbreak or root the device. This software has many different functions which operate without the device being jailbroken or "rooted". mSpy monitoring software works with computers, tablets, iPhones and Android devices. The installation process is very easy and takes less than 5 minutes to be fully setup. We recommend the "PREMIUM" package when placing your order. Although the basic package is cheaper it lacks many of the advanced features that make this software so great. Using this software is very easy. Once you have purchased a subscription you will receive a download link. Simply access the download link from your mobile device and the software will automatically install itself. You will then be able to access and monitor all information from the device through an internet control panel. The spy application will be totally hidden on the device and it will be impossible to detect. Allowing children to use internet enabled devices is a big concern for any parent, especially those who work long hours and just aren't around to see what their kids are getting up to online. Using mSpy, you will be able to view all activity from your children from anywhere in the world using the internet based control panel. If you are not able to install this software yourself, we can even purchase a cellphone and install mSpy for you. We will then send your device to you using EMS shipping inside Thailand, you will then be able to access the mSpy control panel and monitor your own device with ease. 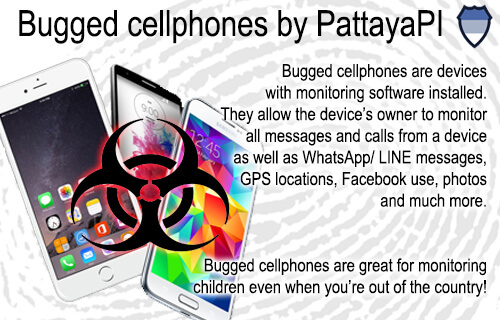 We find that this is a great option for customers that can't install the software themselves and need a monitored cellphone inside Thailand. This software works in any country worldwide!